Buster Posey went 5 for 5 while driving in three runs and scoring three more as the San Francisco Giants piled up 19 hits in a 13-2 route of the Milwaukee Brewers at AT&T Park last night. Wily Peralta has been rocked now in back to back starts. Last night, he was pulled after three innings when his pitch count reached 80 and his runs allowed count reached six. Marco Estrada relieved Peralta and gave up two runs in the fourth and five more in the fifth. The Milwaukee Brewers went 2-2 on their trip to Chicago and were headed to Los Angeles staring at Zach Greinke and Clayton Kershaw in the first two games of their weekend series with the Dodgers. Not only did the Brewers beat those two, but they sent Dan Haren to the showers early after scoring six runs in the first three innings, on the way to a 7-2 win and sweep of the Dodgers. Wily Peralta (15-7) pitched six scoreless innings, allowing 5-hits for his 15th win. Peralta tied Adam Wainwright (St. Louis) and Johnny Cueto (Cincinnati) for the major-league lead with 15 victories. The Brewers gave Peralta all the offense he would need early. 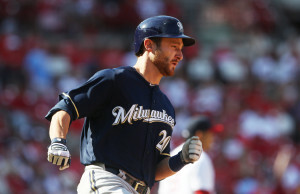 Jonathan Lucroy clubbed a 2-run home run and a 3-run double in his first two trips to the plate, tying his season high with five rbi’s. Jean Segura’s sacrifice fly in the 3rd inning gave the Brewers their sixth run and Carlos Gomez, who walked his first two times up, sent his 20th home run of the season in the fourth. The Dodgers didn’t score until the 8th when Andre Ethier and Scott Van Slyke belted back-to-back doubles off of reliever Marco Estrada. The Brewers get a well deserved day off today before opening a 2-game series against the Toronto Blue Jays at Miller Park on Tuesday night. Marco Estrada surrendered a pair of solo home runs but held the Brewers close before falling 4-1 to the Toronto Blue Jays in Toronto. Estrada leads the Major Leagues in home runs allowed with the number climbing to 26 now. Estrada (7-5) worked six innings, allowing six hits before giving way to the bullpen. Drew Hutchison was holding the Brewers in check. He worked seven innings, striking out 10 hitters, including 8 of the first 12 to earn the win. Jose Bautista and Colby Rasmus clubbed the Toronto home runs. The Brewers got on the board in the sixth with Scooter Gennett singling with two outs. Ryan Braun followed with a double to right field to score Gennett and cut the Toronto lead in half (2-1). Toronto added a pair of insurance runs in the 8th against Rob Wooten on an RBI triple by Melky Cabrera and an RBI double by Edwin Encarnacion. The final game of the series is this morning (11:37am). Wily Peralta (9-5, 3.20) goes for the Brewers. Toronto counters with J.A. Happ (7-4, 4.29). The Milwaukee Brewers bats came to life in Miami on Friday night, pulling out a 9-5 win over the Marlins. Carlos Gomez had three straight doubles and four hits overall, Mark Reynolds clubbed a pair of two-run home runs and Khris Davis went deep to lead the Brewers 13-hit attack. Eight of the thirteen hits went for extra bases. With Ryan Braun still sidelined, Brewers manager Ron Roenicke moved Carlos Gomez into the cleanup spot, Jonathan Lucroy into the three-spot and Jean Segura into the leadoff spot. For at least one night, the moves paid off. Marco Estrada struggled on the mound but the offensive support allowed him to pick up the win and improve to 4-2 on the season. Estrada served up four home runs, two to Giancarlo Stanton and two to Garrett Jones. Estrada has now give up 16 home runs this season, which leads the Major Leagues. In April, Estrada put together a 2.87 ERA in five starts in April. In May, Estrada has made five starts and has a 5.16 ERA. Wily Peralta (4-3, 2.18) pitches game two of the series for the Brewers tonight. Jacob Turner (0-2, 6.59) goes for Miami. The Milwaukee Brewers coughed up a blew a 4-2 lead in the 7th and fell to the Atlanta Braves 5-4 at Turner Field last night. 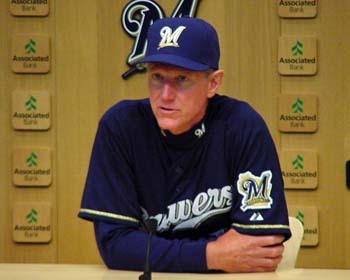 With pitching coach Rick Kranitz and bullpen coach Lee Tunnell away to attend graduations within their families, communication between their replacements and manager Ron Roenicke suffered. Roenicke wanted right-hander Brandon Kintzler and lefty Will Smith to warm up, but only Kintzler got ready to pitch. Kintzler entered the game with the Brewers leading 4-2 in the 7th. Gerald Laird hit a bouncer that caromed off the glove of diving third baseman Mark Reynolds and into shallow left for what became an RBI double, leaving runners at second and third. Roenicke then went to the home plate umpire for a double switch, which included left hander Will Smith out of the bullpen. Smith wasn’t loose and was given only 8 warmup pitches once he arrived to the mound. The home plate umpire (Fieldin Culbreth) asked the league about allowing Smith to throw more warmup pitches and they said “no”. The next hitter was pinch hitter Ryan Doumit who singled to drive in both runs and gave the Brewers the 5-4 lead. It also spoiled a solid performance by Matt Garza who allowed 5 hits in 6 1/3 innings and was charged with four of the five runs. The loss goes to Brandon Kintzler. The Brewers dropped 3 of 4 to the Braves in the series and are now 2-5 on the road trip. The Brewers have lost 12 of their last 15 games at Turner Field. The Brewers will send Marco Estrada (3-2, 3.64) to the mound for game 1 of a three game series in Miami against Marlins right hander Tom Koehler (4-3, 2.25). since their Easter Sunday brawl at PNC Park in Pittsburgh. Marco Estrada allowed 6-hits in six innings, walking two and striking out eight as the Brewers earned a 5-2 victory. It’s the Brewers 7th win in eight meetings against the Pirates this season. The Pirates jumped on the board in the first with a solo home run from Neil Walker, but they squandered several more chances over the next several innings. Estrada struggled with his command but still held the Pirates in check, avoiding the big mistakes. He improved to 6-0 with a 1.97 ERA in 13 appearances against Pittsburgh lifetime. The Brewers gave Estrada a lead in the third when Jonathan Lucroy drove in two runs with a single in the third.